This is not a very good photograph, but I find it compelling because it shows a very atypical view of the tower of the Olympic Stadium in Montreal. 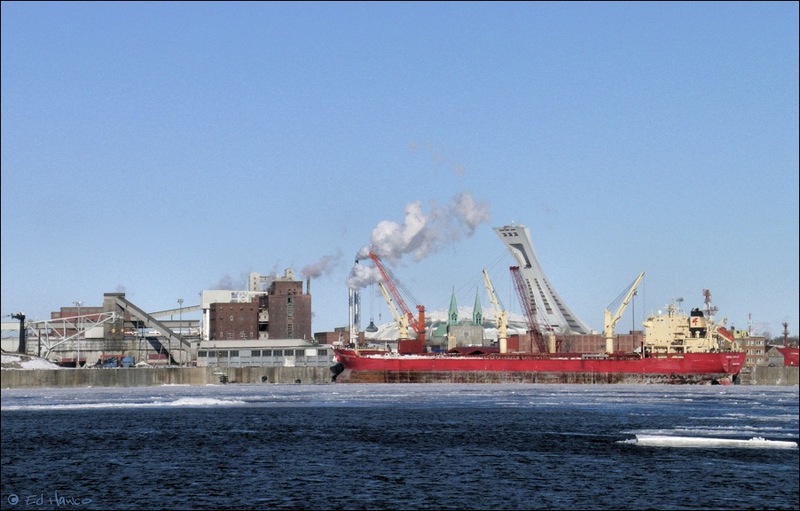 It was taken from the south shore of the St. Lawrence River, from the marina in Longueuil. In a sense, the image shows a microcosm of the city's icons, landmarks, and history. There is the stadium itself (often referred to as "The Big O," or "The Big Owe"), the river, stinky industrial artifacts, a ship, red brick buildings, ice, and of course, a church.